Back in the ‘70s, Mazda's tepid little family car took liberties with the appellation "Great." But today Nice Price or Crack Pipe has a GLC that should be PDQ, and it asks orange you glad I didn't say banana? Despite an asking price so high you could get a nose bleed just looking at the window sticker, the CLK Black roared into a 80% nice price win, and painted some dark fantasies for us all. Don't put away your crayons just yet because after that Mercedes got done coloring outside the lines we have a Mazda that's been painted a color which defies rhyme, and has had an engine transplant that seems within reason. The first generation GLC - short for Goes Like Crap Great Little Car - brought Mazda back from the brink of financial ruin, and paved the way for the RX-7 sports car. The two-seat RX-7 made the rotary engine seem acceptable in polite company once again and the GLC fulfilled the basic transportation needs of thousands of those without a Honda or Toyota dealer within walking distance. Other than a shared parentage, these two cars had little in common. . . until now. What we have here is a 1979 Mazda GLC, from which the 1.4-litre carbureted four-banger has been plucked out, and in its place has gone a botox-injection of horsepower also known as a 13B rotary. While this car's predecessor had been made available with a rotary, the GLC was left wanting for a wankel until its hopes and passions were fulfilled by someone looking to build a sleeper. He doesn't say what flavor of 13B it is but does claim that it's spankin' new, has a pair of MSD Blasters and "the expensive kind" of spark plugs. Of course he also says it's a fuel injected motor, and then states that it's got a Holly 600 - which is what that looks like sitting under the Paul Revere cap air filter. Details, details. Custom rims, extra gauges from the gauge aisle at Pep Boys, and RX3 seats round out the mods. The paint job on the car is so orange you'd expect the interior to be full of pulp. It isn't however- instead, it's full of speakers. While externally, it may appear a sleeper, they'll hear you coming before they see you, and when you're cranking R. Kelly you'll be able to marvel at the way your nuts bounce off the upholstery with every beat. It's incredulous that doors haven't each snapped off their hinges due to the weight of the four massive speakers mounted in the bottom of each. And if you plan on taking the car on any trips, you'd have to pack light, as the under-hatch is filled with bazookas, amps and the spare wheel- although, sadly, there appears to be insufficient room for the spare tire to be mounted on that. But hey, that might be your cup of OJ, and even if it's not, you could sell all the big audio dynamite to somebody else, making your investment in the car an even better deal. And the dealio from the seller is $4,500 out the door, and that includes something he calls "ovelacape." 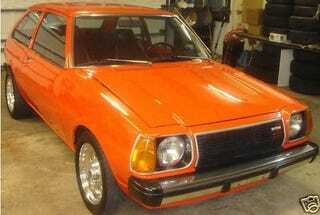 So, would you squeeze $4,500 out of your bank account for this tangerine dream? Or, at that price, is it the pits? eBay, or go here if the ad disappears. Mad props to SlowMo for the tip!